True one-level living with a 3 car garage & perfect yard! This home features a wonderfully open layout w/great Southern exposure for lots of light, large rooms, vaulted ceilings, formal & informal areas - it's perfect for everyone! The Kitchen is very spacious with ample cabinets & counter space, pantry closet, island w/breakfast bar, eating space, planning desk & wood flooring which overlooks to the great Family room w/Gas FP, recessed entertainment area, Wet Bar area & ceiling fan. 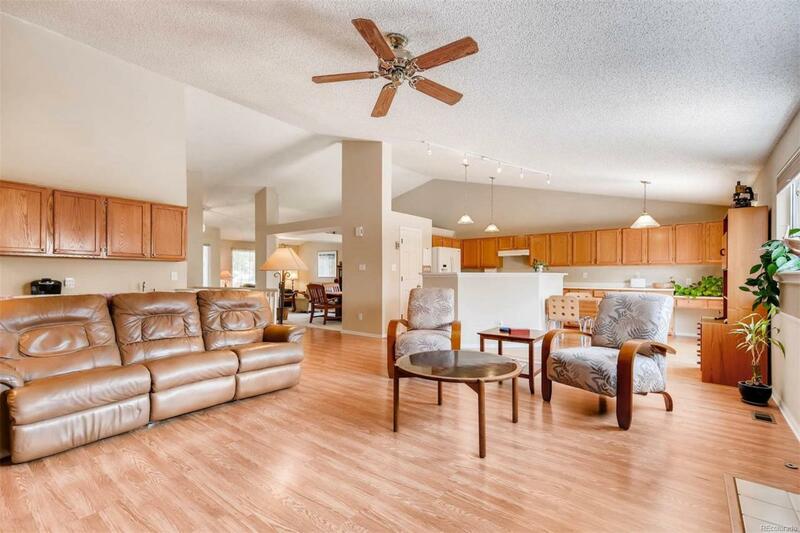 The Master retreat features his & her's closets & luxury bath w/newer tile flooring. Both guest baths have tile floors, as well as the Laundry room with a sink & shelf for convenience. There are 2 additional guest Bedrooms (one can be used as an office with it's french doors off the entry & walk-in closet - your choice)! The backyard is a private oasis w/an expansive patio, partial Gazebo cover & don't miss the concrete walkway along the west side of the home! Very well maintained & Wheelchair accessible. Offered by Mb Kamin Companies Ii.